SINGAPORE--(Marketwired - Nov 12, 2013) - World's leading laptop computer cases and accessories maker Targus® Inc. unveiled their new collection of cases in line with the release of the iPad® Air. "Targus® has always been in the forefront of Apple® accessories," said Christina Cheung, Product Marketing Director, APAC. "Continuing in our pursuit for style and functionality, we have established a brand name that is almost second to none when it comes to quality." Based on consumer feedback, research and development, a collection of seven different iPad® Air cases under the Midnight Series is launched to create a grown-up range for the style-conscious. This series exude a sense of class and sexiness, introducing dark colours with a twist such as Black Cherry, Crimson, Midnight Blue, Black Noir and Hornet Green. The Midnight Series also feature the world's first rotating case for iPad® from Targus®, with a patent pending on its best-selling Versavu™ case now available for the iPad® Air. Made from a rich mixture of textures such as faux leathers and ultra-twills combined with pearlescent and matt finishes, the Midnight Series effortlessly instils visual and tactile interest in iPad® enthusiasts. Functionality is never compromised; the Midnight Series cases are specially designed using highly-durable fabrics as well as water and stain-resistant interiors that are soft to the touch. By combining design with functionality, the Midnight collection offers a range of different designs to suit the way you use your tablet. Be it at home, on the move, with the kids, or at work, Targus®' Midnight Series will enhance your experience no matter where you are! Targus® Midnight Series cases are bound to steal the limelight, especially with their Flipview™ Case and Versavu™ Slim Case. The Flipview™ Case reigns over the Targus®' Midnight Series with its new and improved slim design equipped with a stylish case that flips open for instant typing or viewing angles. The Versavu™ Slim Case on the other hand incorporates a special 360° rotation function for easy portrait and landscape viewing which is perfect for a more flexible usage. These two new Targus® cases will surely delight those who favour a more flexible approach to their iPad® protection cases. The FlipView™ Case is one of Targus®' Midnight Series superstars, exuding desirable superiority that will surely turn heads wherever it goes. Sleek in its silhouette but packed with sophistication, this one-of-a-kind case enables you to easily flip your iPad® into ideal typing and hands-free viewing positions in one hand motion, a great feature that will surely delight all iPad® users. The tone-on-tone material combination is uniquely designed to give the FlipView™ Case a refined appearance while being sturdy and firm. The interior on the other hand is lined with materials that are soft to the touch which is gentle on your iPad® and the discreet cord closure helps keep the case closed and secure during transport. With its super sleek design and maximum protection capabilities, the FlipView™ Case has everything you need. The FlipView™ Case for iPad® Air is available in Noir (THD039AP), Midnight Blue (THD03901AP), Black Cherry (THD03902AP) and Crimson (THD03903AP). One of the forerunners in Targus®' Midnight Series, the Versavu™ Slim Case is specifically designed to entice all iPad® Air users in every way! Made exquisitely from Faux Leather (available only with the Versavu™ Slim Case in Noir) and Ultra Twill material, it is impossible to resist its chic and dapper aesthetics. The case exterior is sturdy and it comes with a discreet cord closure that keeps the case closed and the iPad secure during transportation. With its custom-fit cradle case and patent-pending 360° rotational design, the iPad® can be easily rotated in the case. 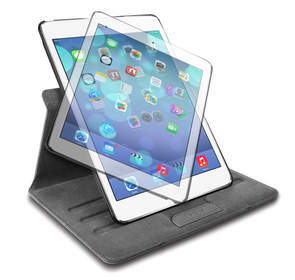 One-of-a-kind foam grooves are also incorporated to enable users to place their iPad®s in different positions for enhanced typing or viewing and its padded cover aims to provide extra protection for the iPad® screen. The most flexible of all cases, the Versavu™ Slim Case is every iPad® user's dream. The Versavu™ Slim Case for iPad® Air is available in Noir (THZ196AP), Midnight Blue (THZ19601AP), Black Cherry (THZ19602AP) and Hornet Green (THZ19603AP). Keyboard-lovers rejoice! Targus® introduces their iPad® Air case that comes with a removable Bluetooth® 3.0 wireless QWERTY keyboard that delivers a great combination of typing and comfort. The Versavu™ Keyboard case has a built-in patent-pending keyboard guide rail system that helps to keep the keyboard in place when in use. Conversely, the keyboard can be fully removed from the case so that users can type in a comfortable position. The patent-pending 360° rotational screen allows users to adjust the screen at different viewing angles to suit different needs. Uniquely tailored with faux leather (available only with the Versavu™ Keyboard Case in Noir) and Ultra Twill material, this iPad® case looks effortlessly stylish while providing the iPad® with maximum protection. The Versavu™ Keyboard Case for iPad® Air is available in Noir (THZ192AP), Black Cherry (THZ19201AP) and Midnight Blue (THZ19202AP). Targus® introduces the Classic Case for the iPad® Air, thoughtfully designed to highlight the tablet's new aesthetics. This stylish case is slim and lightweight, making it the perfect case for those in favour of a more straightforward approach. The exterior of the case is made of pearlised PU material which enables easy cleaning whilst the soft touch texture on the interior delivers greater protection and a secure feel. The EVA back moulding of the Classic case provides maximum protection for your iPad® as well. Easy access to all ports and controls, the Classic case makes for an effortlessly fuss-free tablet protection that meets your daily needs. The Classic Case for iPad® Air is available in Noir (THZ194AP), Black Cherry (THZ19401AP), Crimson (THZ19402AP) and Fuchsia (THZ19403AP). The Triad case can be folded into a firm platform for viewing and typing positions with thanks to the added silicone base. The smooth finish of the case gives it a sleek and classy look, and the pearlised PU material used for the exterior make it easy to clean as well. The Triad case is also designed with a discreet cord closure to keep the screen flap securely in place. The thin yet durable hard shell backing of the case protects all sides of the iPad® without the added bulk. 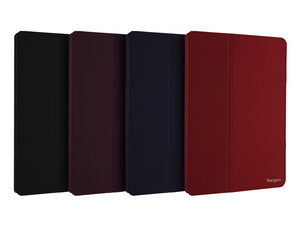 Introduced in four beautifully enticing colours, this fashionable case is bound to take the iPad® case market by storm. The Triad Case for iPad® Air is available in Noir (THD038AP), Midnight Blue (THD03801AP), Crimson (THD03802AP) and Black Cherry (THD03803AP). This clean and professional looking case is durable yet versatile, making it an excellent tablet protection case for both work and play. The easy-to-clean exterior is designed with an integrated stylus holder which ensures that your stylus is always kept close at hand. With its soft-touch inner lining and padded cover, the Vuscape™ case keeps your iPad® screen free from scratches and the iPad® safe and snug while providing maximum protection. The special design of the case also allows the iPad® to be placed in multiple viewing positions as well as an ideal typing position. Sleek, functional, lightweight and classy, the Vuscape™ Case is definitely going to win the hearts of many. The Vuscape™ Case for iPad® Air is available in Noir (THZ195AP), Midnight Blue (THZ19501AP), Crimson (THZ19502AP) and Snow (THZ19504AP). The Notepad Folio Case for iPad® Air is available in Noir (THZ227AP) and Black Cherry (THZ22701AP). Targus® created the mobile accessory category with its invention of the laptop case 30 years ago. The company continues to advance the mobile accessories category with innovative and relevant solutions for today's lifestyle. Targus products enhance productivity, connectivity, and security, liberating consumers to use their mobile devices in any and all environments with the utmost convenience and comfort. Founded in 1983, Targus' headquarters are located in Anaheim, Calif., with offices worldwide and distribution agreements in more than 100 countries. For more information on Targus visit http://www.targus.com. About this company Targus(R) Inc.